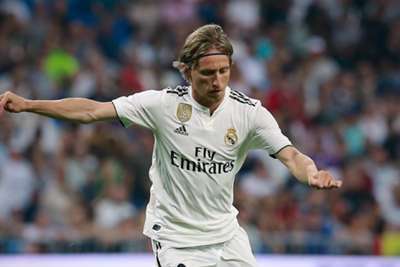 Real Madrid have left Luka Modric out of the starting XI for their UEFA Super Cup meeting with rivals Atletico Madrid amid speculation the midfielder could leave the club. Modric, who has only played 14 minutes of pre-season, has been linked with a move to Serie A side Inter since claiming the Golden Ball award at the World Cup for his role in leading Croatia to the final. The midfielder was named in a 29-man squad to face Atletico but is included among the substitutes by new coach Julen Lopetegui. Keylor Navas is selected over new goalkeeper Thibaut Courtois, who is not even on the bench. With Cristiano Ronaldo having joined Serie A champions Juventus in a deal worth €112million, Gareth Bale and Karim Benzema start for Madrid in attack with support from Spain internationals Isco and Marco Asensio. Atletico hand competitive debuts to new signings Thomas Lemar and Rodrigo, while Diego Godin takes the captaincy after succeeding the departed Gabi in the role. Diego Costa partners Antoine Griezmann in attack, the World Cup winner having scored three goals in his last five games against Real Madrid in all competitions. Take a look at our starting for the UEFA #SuperCup!